Energy Trust is starting to work with two retailers to offer instant discounts on water heaters. Instant discounts are the same amount as cash incentives for qualifying models, which means customers can receive up to a $300 discount when purchasing a qualifying water heater, no incentive application needed. The discount is applied at the time of sale and is included in the retailer’s final price. Energy Trust field staff will place stickers next to the price tag of qualifying models to show the final price after Energy Trust instant discounts. The price shown on the shelf is the price that will ring up at check out. Water heaters purchased at retailers who do not offer instant discounts are still eligible for cash incentives after the customer submits an incentive application. Instant discounts are only available at select Grover Electric Plumbing and Supply and Lowe’s store locations in Oregon. 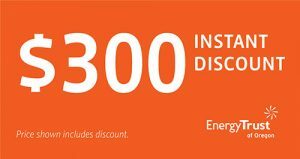 For a full list of stores offering instant discounts, visit www.energytrust.org/hotwater.